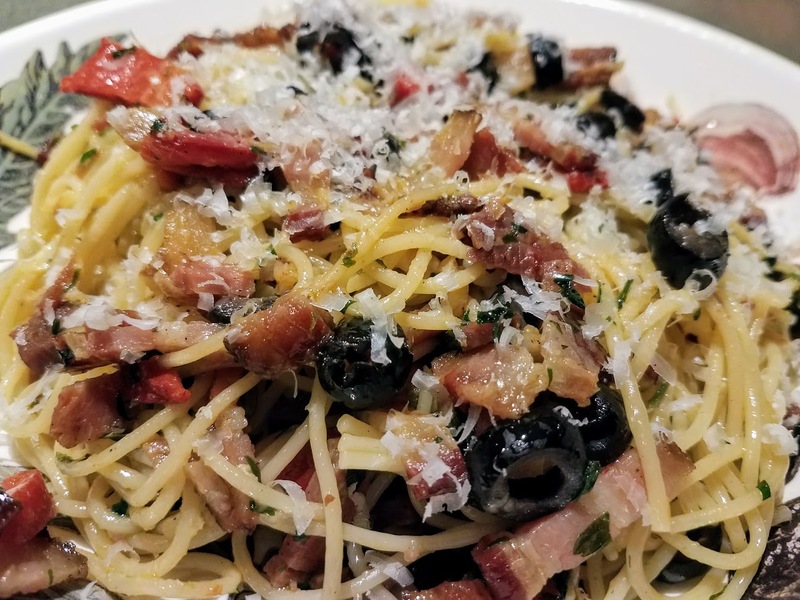 Spaghetti carbonara is a combination of some great elements. Perfectly cooked spaghetti flavored with cured pork, Parmagiano Reggiano cheese, and finished with a delicate coating of custard-y egg. This dish is a memory of my childhood, and is vivid in my mind. In 1974, my dad started his own cabinet making business. He was a true master craftsman; a perfectionist. Before he started his business, he took us on a cross country trip in his huge Dodge station wagon. Little did we know that the big change was coming where he would transition from an employee of a business to running his own place. When we returned from our big (and very influential in my life) car trip, the one and only family meeting we ever has was summoned. It was announced that my dad was no longer working at the old place, but would be starting his own new place. It was an exciting time as I could tell this was what my dad wanted, an opportunity to manage his own destiny. With the new business, my mom explored new recipes to make ends meet and still put excellent food on the table. Spaghetti carbonara was one of those dishes. Many times, she would make it in a huge skillet and keep it warm if my dad worked late. He often worked late in those days, and I would rush to give him a big hug at the door. He would smile and ask if I could guess what type of wood he was working by the smell of his clothes. Then he would sit down to dinner. Carbonara is best eaten within the minute the eggs are added, but my dad didn’t care if it was a bit dry, he was home with us. The memory of that dish stuck with me. These days, I cure my own bacon, typically have ham on hand, and all the other usual ingredients. It is a dish of convenience, but one that never fails to bring back all those memories of home. The trick to making this dish and getting it on the table in a hurry, is to assemble everything to have it ready to go. I start by slicing the bacon, guanciale, or pancetta. We almost always have homemade bacon on hand. I slice enough to fill my large carbon steel skillet. Set the skillet over low – Medium heat and put in the bacon strips to cook very slowly. You need a large skillet that will hold all the ingredients in the end, including the pasta. A well-seasoned carbon steel wok works well if you are making a large batch. While the bacon is crisping, I prep the other ingredients and put the pasta water on to boil. Add the olive oil and butter to the skillet on medium heat. Salt the pasta water and cook one pound of spaghetti. Cook for 1-2 minutes less than al dente because the pasta will continue to cook in the dish. Plus, I think slightly undercooking the pasta to start allows it to slightly absorb the egg later, coating it better and giving a slightly better flavor. Add the ham and the garlic to the pan. Stir and cook until the garlic is cooked through and the ham is crisp on the edges. Add the roasted red pepper and parsley. Continue to stir so everything cooks evenly. Cut the bacon into lardons about 1/8” across the strips. Add to the pan. Drain the spaghetti and add to the pan. I use tongs and a spoon to mix everything as much as possible. Add in the grated cheese and toss to evenly coat. Add the olives and mix them in. Remove the pan from the heat. Pour the beaten eggs over and use the tongs again to quickly and evenly coat the pasta. Keep the egg off the skillet so it does not solidify. Serve immediately topped with a bit more cheese. Don’t overdo it with cheese because it will overtake the egg. Start to finish, I can get this on the table in about 30 minutes. Prev I Love You, Ham!